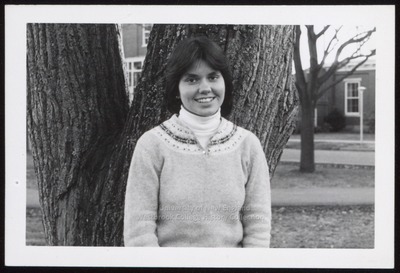 "Colleen A. Hetherman, Westbrook College, Class of 1980"
Westbrook College student Colleen A. Hetherman, Class of 1980, was a Dental Hygiene major and lived in McDougall Hall. For her senior class candid photo, which appeared in the 1980 Tower Yearbook, she wore a Fair Isle sweater and a white turtle neck jersey. Her hairstyle was a medium length shag. Colleen stands in front of a tree trunk on the Campus Green in front of Proctor Breezeway.